Matt Crafton, driver of the No. 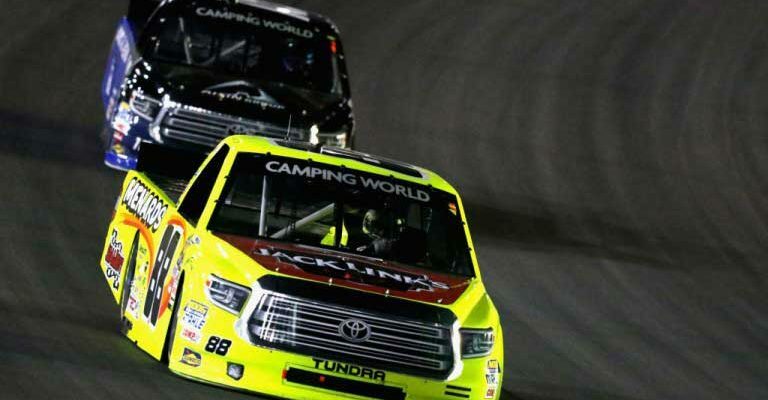 88 Jack Links/Menards Toyota Tundra made his 19th career start at Kentucky Speedway in Thursday night’s rain-delayed NASCAR Camping World Truck Series (NCWTS) Buckle Up In Your Truck 225. Starting fourth, when qualifying was canceled due to weather, and the field was set based on the rule book – 2017 owner points – Crafton ran as high as second in Stage 1, and finished third. Unfortunately, the 2015 Kentucky Speedway race winner suffered damage to the right side of his Menards Toyota Tundra following a lap 43 incident in Turn 3, involving two of his teammates. Carl “Junior” Joiner brought the No. 88 machine down pit road multiple times under caution, to repair the damage, and Crafton would restart from the 22nd position at lap 51. At the conclusion of Stage 2, at lap 72, Crafton was scored in the 12th position. 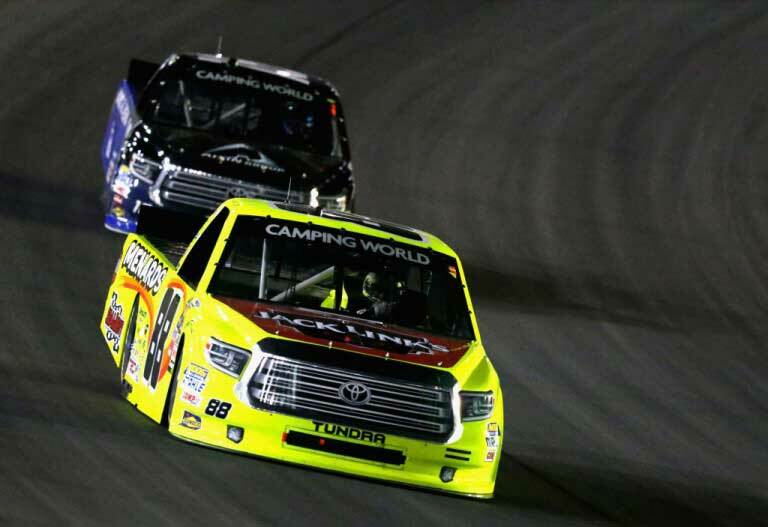 Although the two-time NCWTS champion complained of a slight vibration, and a “tight in the center of Turns 3 and 4” condition on his Toyota Tundra, the ThorSport Racing driver showed speed throughout the final Stage, running inside the top-10 for the remaining 74 laps. Crafton would cross the stripe in the eighth position behind race winner, Christopher Bell. The NASCAR Camping World Truck Series (NCWTS) had two practice sessions on Wednesday afternoon in preparation for Thursday night’s Buckle Up In Your Truck 225 at Kentucky Speedway. Matt Crafton was eighth, and fourth, respectively, in each session. Qualifying for the 20th annual event was canceled on Thursday evening due to weather. The 32-truck field was set based on the rule book – 2017 owner points – and Crafton rolled off from the fourth position for the 150-lap event. Thursday night’s Buckle Up In Your Truck 225 at Kentucky Speedway marked Crafton’s 19th career start at the 1.5-mile oval. The Menards driver started fourth, ran as high as second, and finished eighth in the 150-lap event. The ThorSport Racing driver earned a bonus point in Stage 1 for finishing inside the top-10. In 19 starts at the Sparta, KY track, Crafton has led 79 laps en route to one win (2015), five top-five, and 14 top-10 finishes. In 10 starts in 2017, the Menards driver has led 72 laps en route to two top-five (Atlanta), and six top-10 finishes. In 394 career starts, Crafton has 12 poles, and has led 2207 laps en route to 13 wins, 99 top-five, and 232 top-10 finishes. Crafton’s ThorSport Racing teammates finished 15th (Coughlin), 27th (Rhodes), and 28th (Enfinger). Up Next: The Aspen Dental 150 at Eldora Speedway on Wednesday, July 19 at 9:00 p.m. ET on FOX Sports 1.